SecureAPlus is listed in Anti-Virus category and made available by SecureAge Technology Pte Ltd for Windows. 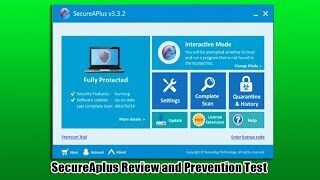 Unfortunately, we have not yet reviewed SecureAPlus. If you would like to submit a review of this software, we encourage you to submit us something! What is SecureAPlus software from SecureAge Technology Pte Ltd, what is it used for and how to use it? SecureAPlus is a free PC security solution that protects your computer from all of today's digital threats such as malware and viruses 100% of the time. With multiple layers of defense through its powerful yet simple Application Whitelisting & Application Control combined with more than 10 anti-virus engines in the cloud with Universal AV. It's the perfect security upgrade you've always wanted in one lightweight application. It's not just an Anti-Virus. The powerful Application Whitelisting technology ensures that only applications that you trust are run by your computer. All malicious attacks that slip by unwary users are always detected and initially blocked. It puts you, not anyone else, in control. Best of all, its fast and easy - after the initial full system scan, subsequent ones take less than a minute to complete. Combining the power of more than 10 industry standard commercial Anti-Viruses, rest assured that you have a comprehensive virus and malware library that boasts one of the highest detection rates possible. Its surprisingly fast and light too. By leveraging the power of the cloud, it barely uses your local hardware, so you can save it for more important things like work or play. Get all the core security features for free on the first year. Extend the license by participating on our quick and easy referral program and get that license extended indefinitely by letting more users know about SecureAPlus. Upgrade to Premium for less than $2 a month/PC/year & take advantage of 24/7 security updates and email alerts from multiple computers at home or work. Download and install SecureAPlus safely and without concerns. SecureAPlus is a software product developed by SecureAge Technology Pte Ltd and it is listed in Security category under Anti-Virus. SecureAPlus is licensed as Shareware which means that software product is provided as a free download to users but it may be limited in functionality or be time-limited. You may need to pay at some moment to continue using product or to use all functionalities. You can run SecureAPlus on all modern Windows OS operating systems. SecureAPlus was last time updated on 19.03.2019 and it has 4,498 downloads on Download.hr portal. Download and install SecureAPlus safely and without concerns. What do you think about SecureAPlus? Download.hr periodically updates software information of SecureAPlus from the software publisher (SecureAge Technology Pte Ltd), but some information may be slightly out-of-date or incorrect. SecureAPlus version 5.3.1 for Windows was listed on Download.hr on 19.03.2019 and it is marked as Shareware. All software products that you can find on Download.hr, including SecureAPlus, are either free, freeware, shareware, full version, trial, demo or open-source. You can't download any crack or serial number for SecureAPlus on Download.hr. Every software that you are able to download on our site is freely downloadable and 100% legal. There is no crack, serial number, keygen, hack or activation key for SecureAPlus present here nor we support any illegal way of software activation. If you like software product please consider supporting the author and buying product. If you can not afford to buy product consider the use of alternative free products. Is it safe to download and install SecureAPlus? SecureAPlus was checked for possible viruses by various leading antivirus software products and it is proven to be 100% clean and safe. Although, no malware, spyware or other malicious threats was found we strongly advise you to check product again before installing it on your PC. Please note that laws concerning the use of SecureAPlus may vary from country to country. Please be sure that you are using SecureAPlus in accordance with the law in your country. How do I uninstall SecureAPlus in Windows Vista / Windows 7 / Windows 8 / Windows 10 OS? Make sure the "SecureAPlus" is highlighted and then make right click, and select Uninstall/Change. How do I uninstall SecureAPlus in Windows XP? Make sure the "SecureAPlus" is highlighted, then click "Remove/Uninstall." How do I uninstall SecureAPlus in Windows 95, 98, Me, NT, 2000? Select "SecureAPlus" and right click, then select Uninstall/Change.